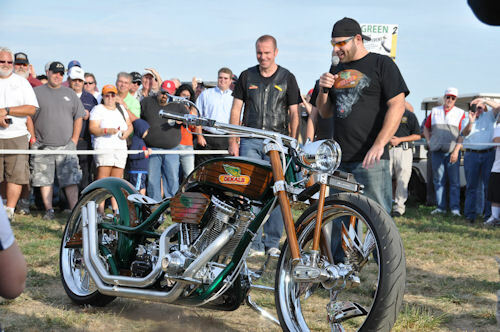 Opening Day crowd gets first look at a new custom chopper, after a little standing time. They came early, lining up behind an impromptu rope, craning to see something new. The promise: a specially designed chopper bike for DEKALB set to capture the essence of a company celebrating its 100th anniversary sculpted in a new form. And they were not disappointed. The new DEKALB Chopper from Paul Jr. Designs rolled into a display area outside the Main Gate just before the show opened. The crowd had waited patiently through the patter of an MC and some bad jokes - yet with a beautiful day ahead the excitement was palpable. TELLING THE STORY: Paul Jr. tells the crowd about the DEKALB chopper as Jason Hoag, team marketing lead, DEKALB looks on. Paul says he kept farmers in mind with the design and details since it's farmers that have made DEKALB successful. The result? The new machine was a crowd pleaser. From its nickel-plated wing spokes on the 23-inch wheels (front and rear) to the woodgrain detail, this is a machine that will catch your eye. "I wanted to capture the history in this," Paul Jr. told the crowd. And capture it he did, with the vintage road-racer look, but there's an aggie viewpoint here too with the tractor seat that's "more comfortable than it looks." And a rain cover for the upturned exhaust that features a 100th anniversary logo. Paul Jr. has said that seeing the winged DEKALB logo was enough to get his mind working. Those wings and the corn were incorporated into the design, but so was the logo itself in relief on one side and as a "worn" logo on the other. The look says "new" vintage. 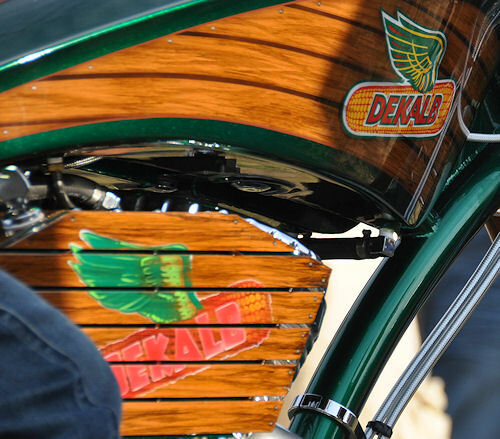 The DEKALB green is there, highlighting a wood-grain accent (there's no wood on this bike) that lends more vintage view to the machine. As for that DEKALB green? "We added a little candy to it," Paul Jr. remarks. ALL IN THE DETAILS: The vintage logo is worked into a panel on the bike (that's aluminum not wood) along with a present day logo on the fuel tank. The bike is built do burn E-85 fuel. Jason Hoag, marketing team lead, DEKALB noted during the rollout that the company started just three hours north of Decatur and today the celebration of the 100th birthday begins. "This bike will travel to a number of locations for the next year and starting in January, we'll auction the bike with the proceeds going to the American Red Cross," he notes. Robb Fraley, chief technology officer, Monsanto, was on hand as well. Impressed by the bike he notes the marriage of technology and innovation are evident in the design. "The detailing here is tremendous and shows the heritage of the company," he notes. The bike is on display at the DEKALB exhibit for Farm Progress Show, next stop is Husker Harvest Days near Grand Island, Neb. And for the next year the machine will be on view at grower and company events around the country.